Install spike approx. perpendicular to ground in Paver Edging hole. Ensure spike tip bend is facing away from pavers. Allow spike to install at an angle. Installed spike will be at approx. angle as shown. Each installation will vary. Edgetite™ Spikes are specifically designed to be installed into hardscape projects that follow industry standards through a properly sized and compacted base. 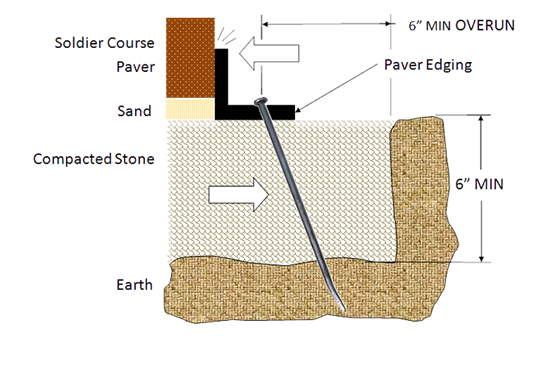 When proper installation guidelines are followed, the head of the spike will press towards the paver during installation, trapping the Paver Edging against the Soldier Course. The video to the right features a 3 year comparison of a spike installation. After enduring three winters, our spikes keep the paver edging firmly in place. Insist on Edgetite™ 10" Paver Edging Spikes - The Spike That Works!